Sino-US relations in 2017 were better than expected. After US President Donald Trump assumed office, Chinese President Xi Jinping visited the US in April and China gave a "state visit plus" reception to Trump in November. The two leaders also met during the G20 Hamburg summit in July. Apart from the three face-to-face contacts, the two talked on the phone nine times and wrote six letters to each other. The interactions between Xi and Trump have been quite frequent. Why have ties between Beijing and Washington beaten predictions? High level of interdependence between China and the US is one reason. The two share quite a number of interests and have to resolve many problems together, such as tackling the North Korean nuclear crisis, fighting against terrorism, stabilizing the international financial market and controlling the spread of diseases. The two must work together even if they do not like each other. China has strived to improve bilateral relations. In April, when Trump's status was quite shaky as many of his policies were facing hurdles, Xi took the initiative to visit him at his Mar-a-Lago resort in Florida. After that, China and the US held four high-level dialogues on diplomacy, security, economic relations, law enforcement and cyber security, as well as social and people-to-people exchanges. When Trump landed in China, he received "state visit plus" treatment. China's effort paid off as contradictions between Beijing and Washington were at least taken care of. Three factors will influence Sino-US ties in the years to come. To begin with, the US we are now interacting with is a "Divided States of America." Those who support Trump and those against him are deeply divided. Not only China, but other countries have also felt it is difficult to deal with the US. The US faces an increasingly confident Chinese people, something it is uncomfortable and unfamiliar with. After the Cold War, interactions between China and the US are only determined by the two. Yet third parties are starting to play their part in Beijing-Washington ties. North Korea, India, Japan, Vietnam and Australia are all making the relationship more complicated. In terms of problems between China and the US, trade is among the most urgent ones. Before the US midterm elections in November, it is likely the GOP will play the card of unbalanced trade relations with China. Trade disputes will thus escalate this year. The North Korean nuclear crisis is another pressing task to be dealt with. The international community used to believe that because of Pyongyang's limited strategic capability, resolution of the nuclear crisis could be delayed. But now, North Korea is making astounding advances and has touched Washington's red line. The US will no longer exercise patience like before. Whether going back to the negotiating table or resorting to military means, the White House will prepare for a showdown this year. 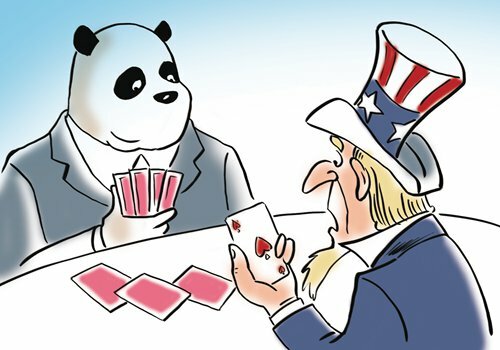 Whatever the decision, it will affect Sino-US ties. The Taiwan question is another issue. Current cross-Straits ties are not positive and US interference is increasing. Washington now deems Beijing an opponent, but the tools the US uses against China are becoming fewer. As US military might has decreased, it doesn't have enough deterrence against China within the First Island Chain. In addition, the US finds economic sanctions to be less effective in ensuring compliance. There is a unique phenomenon in Sino-US trade - half of Chinese products exported to the US are made by American companies operating in China. Beijing's economic might is too strong to be challenged by sanctions. Earlier, the White House was able to isolate Beijing diplomatically, because it is the No.1 superpower in the world and has many allies. But now China has gained popularity and isolation has become a less powerful tool in the hands of the US. Furthermore, Washington used the internet to spread Western ideas and denounce the Communist Party of China. But now because of the changed atmosphere in China, this tool has become impractical. The US has used its National Defense Authorization Act for fiscal year 2018 to strengthen defense partnership with Taiwan, normalize the transfer of military items and defense services, invite Taiwanese troops to participate in military exercises, carry out a program of exchange of senior military officers and top officials with Taiwan and "consider the advisability and feasibility of reestablishing port of call exchanges between the US navy and the Taiwan navy," which provoked China the most. Once a US aircraft carrier docks at Kaohsiung port, Taiwan independence forces will feel encouraged and the situation on the island will spiral out of control. That's why a minister at the Chinese Embassy in Washington, Li Kexin, said the day a US Navy vessel arrives at Kaohsiung is the day the Chinese People's Liberation Army unifies Taiwan by force. US interference in Taiwan will spell real trouble for Sino-US ties in the future.